I decided to just document this as a step by step strip of the engine, that way someone else can follow it (with the service manual handy) and have a good chance of doing the job properly. Metric socket set – most set screws are 10mm but there are some larger set screws as well. Torque Wrench or long extension bar. With a 10mm ring spanner in hand I loosened off the cam cover set screws and bagged them. I also remove the cam chain tensioner so the chain is loose. Next came the cam caps (4 off) and finally removal of the cam shafts, I bagged the cams as shown below and made sure that I had plenty of space to sit everything as it cam off. The bags are the standard zip lock bags you can get at the super market, a few different sizes was a good investment. 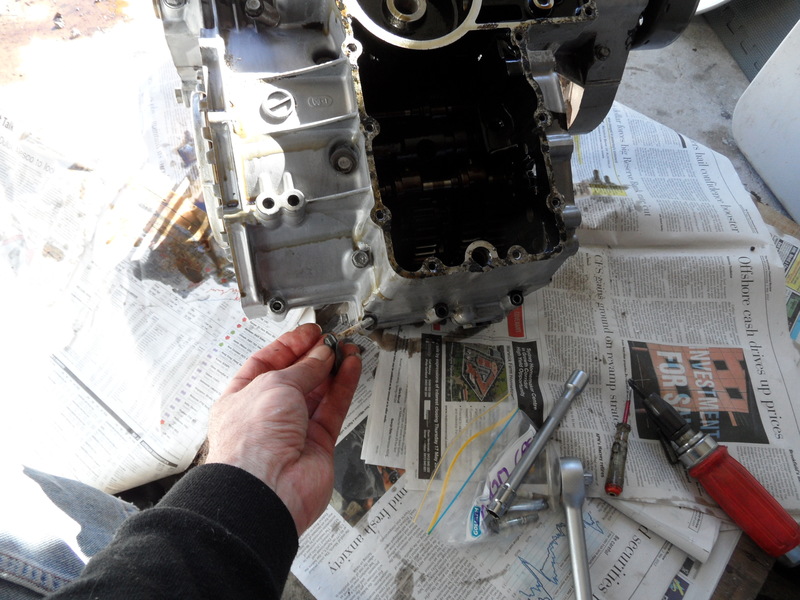 At this point the engine looks like below, note the pipe inserted to hold the cam chain from dropping into the motor. 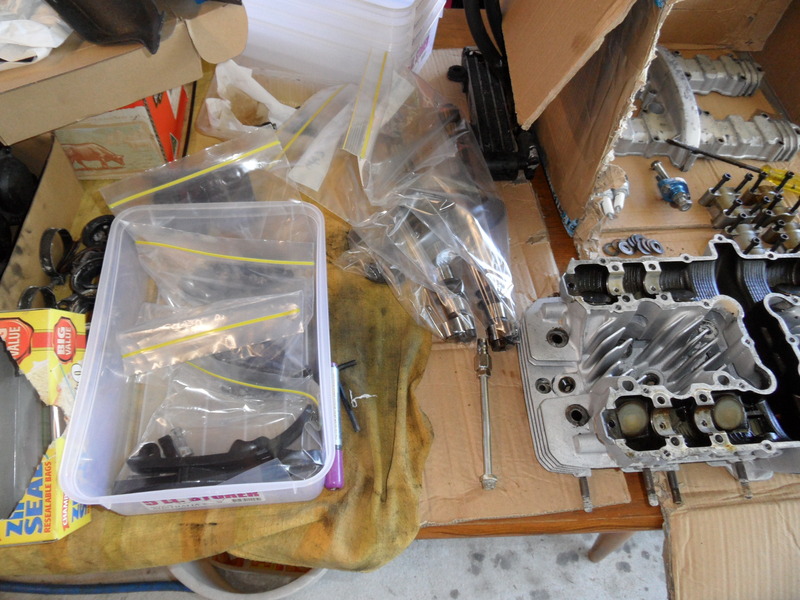 Now its time to remove the cylinder head, first the 2x 10mm bolts at each end and then the large 12mm nuts that are torqued down to keep it together. 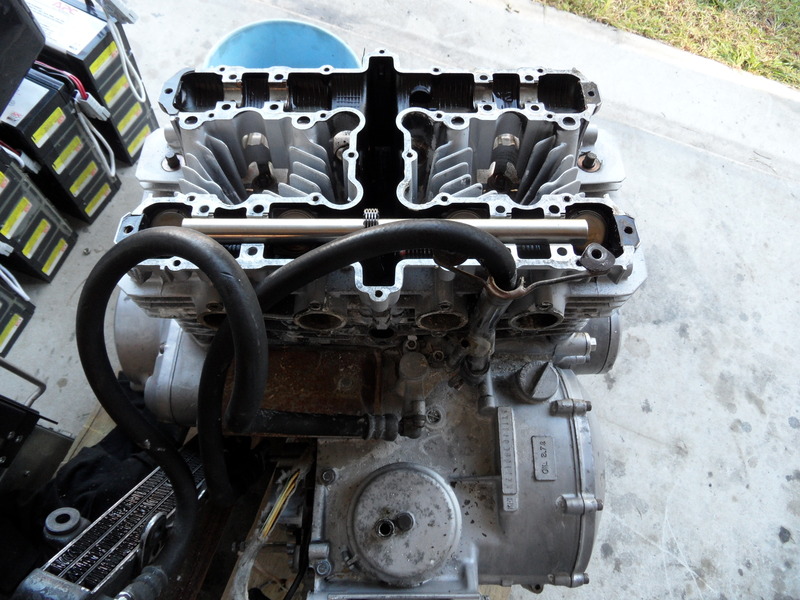 This engine has had the standard ones removed and APE aftermarket cylinder head nuts installed. When the head is raised up, you should see the barrels. Hook something onto the cam chain and let the chain slip down through the head. The white material is the soda from the soda blasting process. The black buildup is carbon. A finger check of the bore reveals its in pretty good condition! I remove the head gasket and keep it aside for the time being. With the head off we can lift the barrels off and then remove the pistons. The pistons pivot on wrist pins and they are kept in place by circlips. The circlips are a once use item, so pry them out from the piston and toss them into the bin. 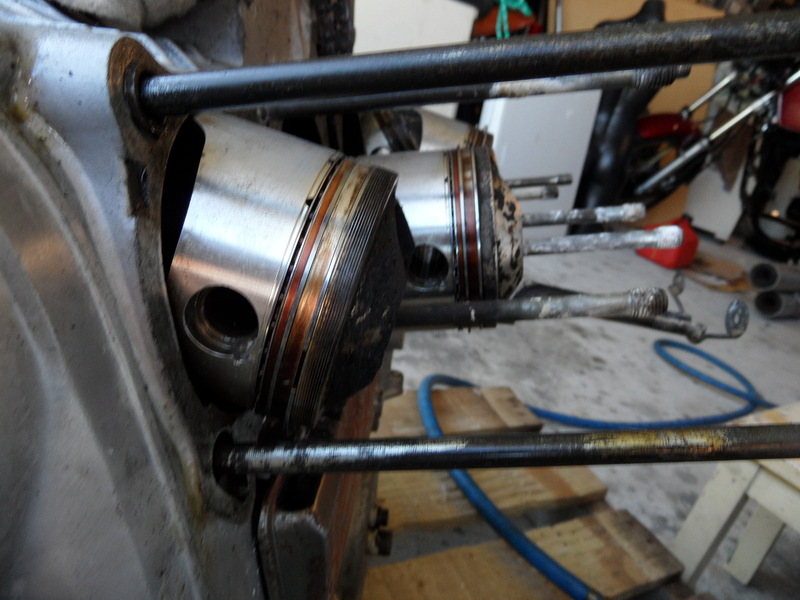 I use a rod to drift the wrist pin out just enough to free each piston in turn and them number the piston. Note the high dome on the pistons, they are massive! With the barrels off, I tilt the engine onto its back end and start on the sump. You can remove the filter cover, the filter then the sump plate at this point and bag all the screws. 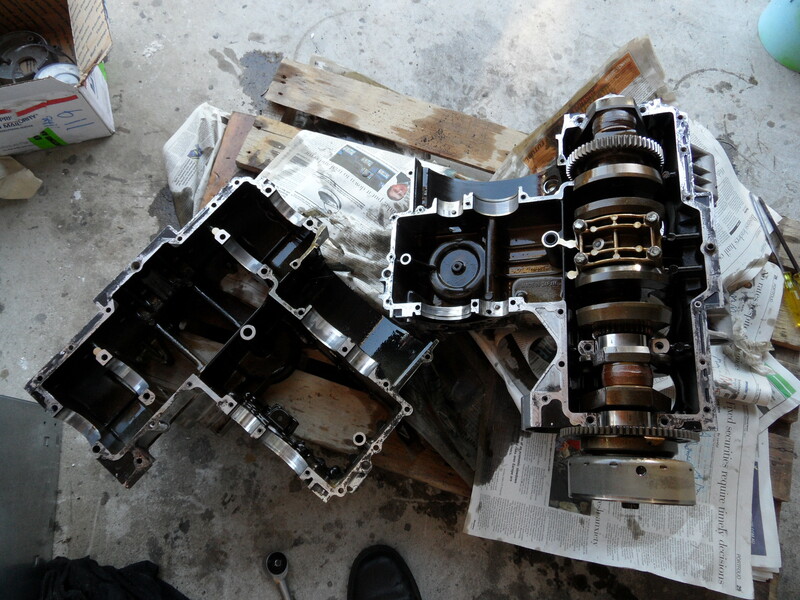 With the sump plate off we can see the oil pump and filter gauze. Its free of metal fillings so that’s a good sign! I also check the sump to see whats lurking in the sludge. 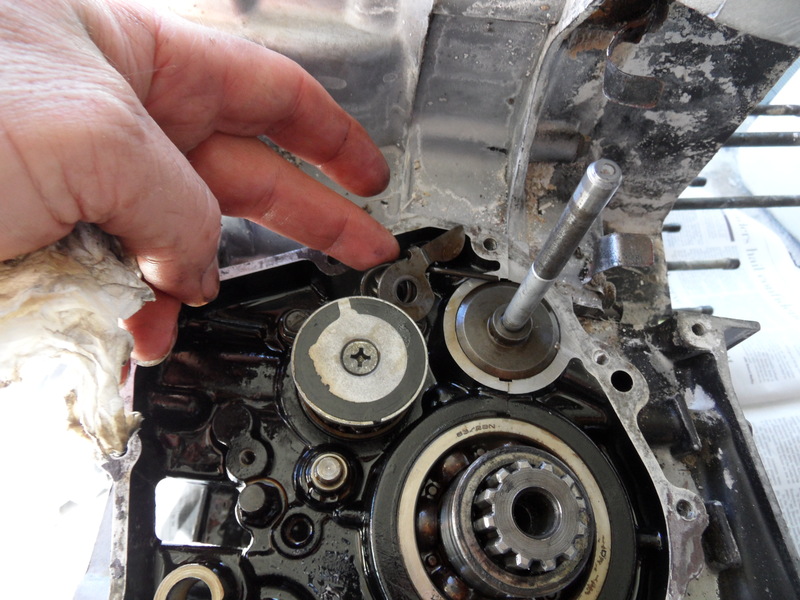 The oil pump is held on by three set screws, bag the pump and screws when you get it off. In order to split the case all the side covers and bits have to come off, I flipped the engine over to the other side and remove the clutch cover (again bagging the screws and don’t forget to write the piece they come out of!). I also take out the electronic ignition pickup plate which then reveals the mechanical advance unit. The trick here is to use a socket and a spanner on the end of the shaft. Flipping the engine back down allows me to take off the oil breather cover. Electric start cover and now I will tackle the starter motor removal and remaining electrical wires. 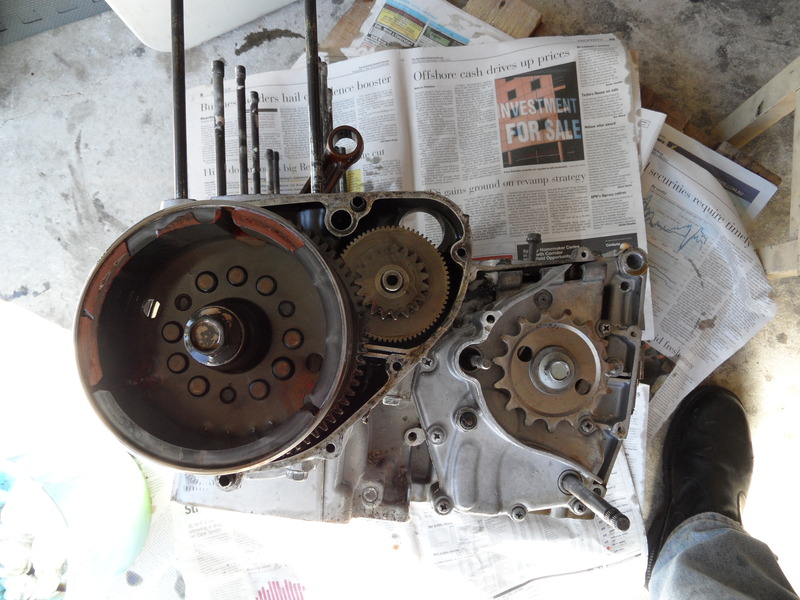 With the starter motor removed, I take off the Alternator cover and then I will remove the starter gear. The big magnet is part of the crank so it can stay. 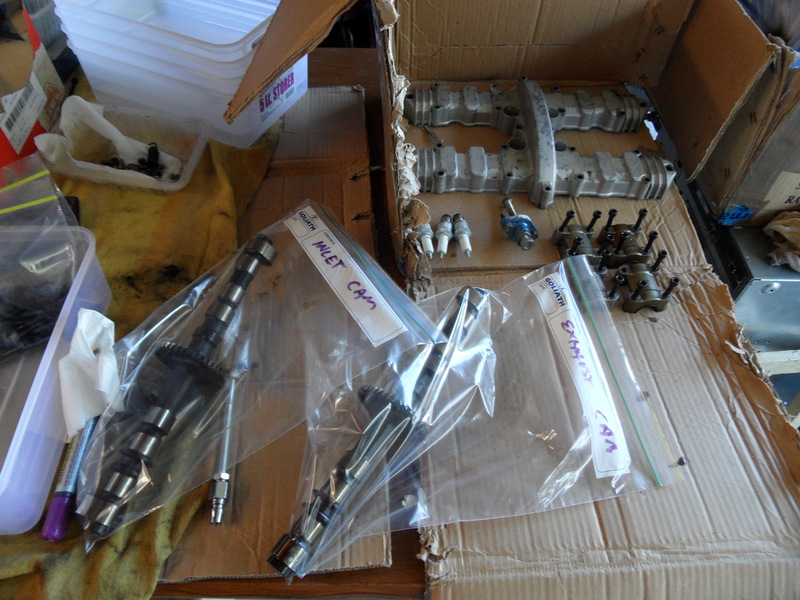 The number of parts on the bench is starting to grow and its all bagged and clean. The alloy covers that need to go in for cleaning are the only loose items as such. I removed the transmission cover after the alternator is off, I needed to use an impact wrench to remove the old screws, and an air ratchet gun removes the bolt that holds the chain sprocket (its a 15 tooth by the way). Interesting side note here, this bolt has a habit of coming loose. Its the cause of Kawasaki’s first ever recall. As far as I can tell this one missed the recall. With the cover off, the gear change and selector drum are shown, I’ve removed the gear changer, it just lifts off, and I have just removed the neutral finder, that leaves the piece I am holding which gives the “Click” feeling as you change gears, a simple spring loaded leaver. I’ll leave the gear change drum until the case is apart. The long shaft is the clutch push rod. It comes out next. With everything from the sides now removed, we can remove the bolts that hold the two cases together, this bolt has a cable clamp on it so I made note of this. Bag all the other screws, keep the top, front and bottom screws separate. With the case bolts removed, the top and bottom cases come apart. 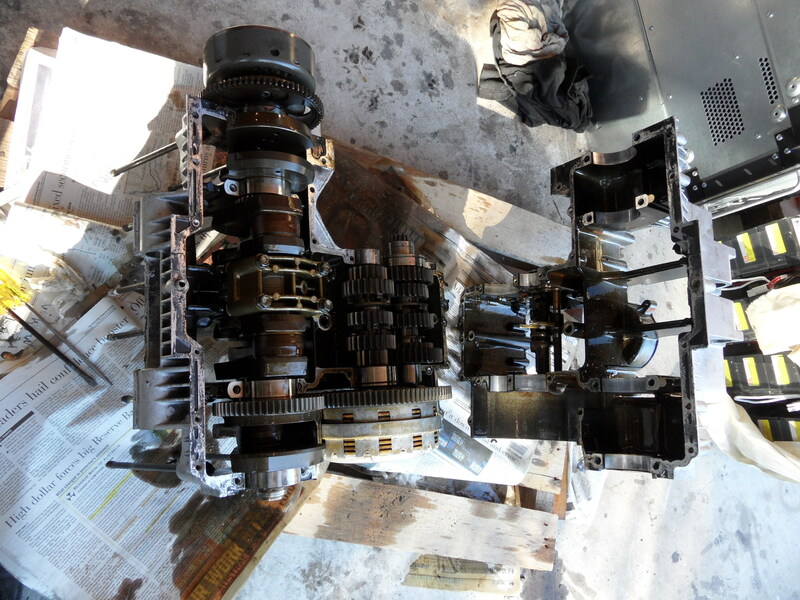 The top case holds the crank, clutch and gearbox shafts, the top holds the selectors. Also note the crank is still held down by the 4 bolt main cap in the centre. I’ll remove this last once I lift the pieces out and bag them up. 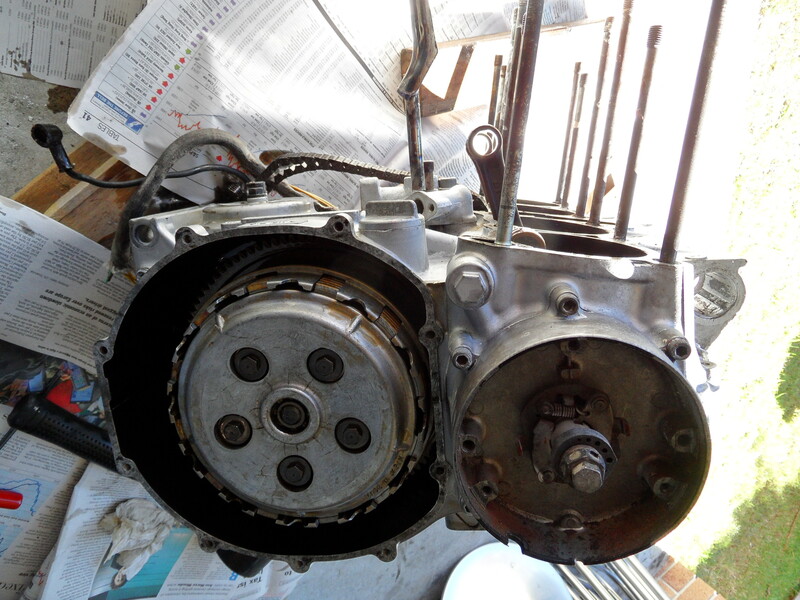 Engine apart – only the crank left to remove. The next task is to clean the oil off everything so the cases can go in for water blasting. 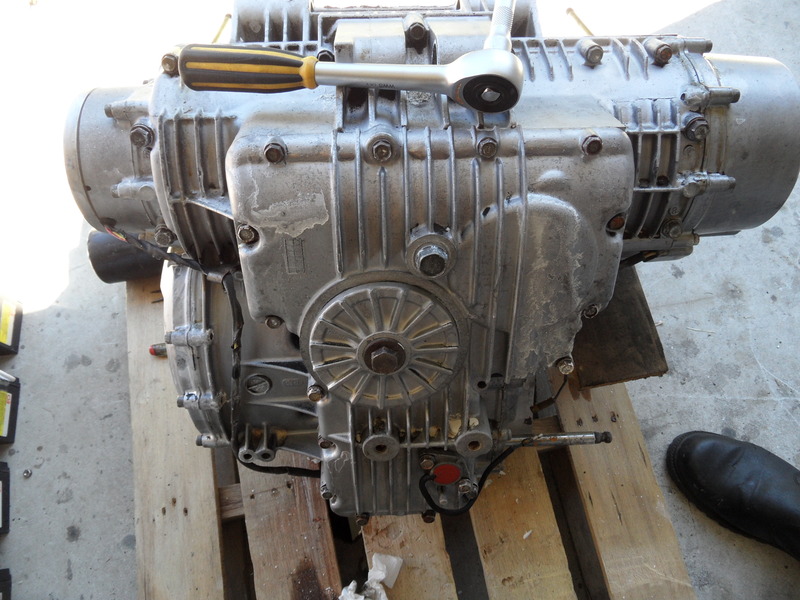 I’ll send the cases in first, and then reinstall the clutch, crank etc and bolt her up. When I pickup the cases I’ll drop more parts over to get done, just so I can control costs. 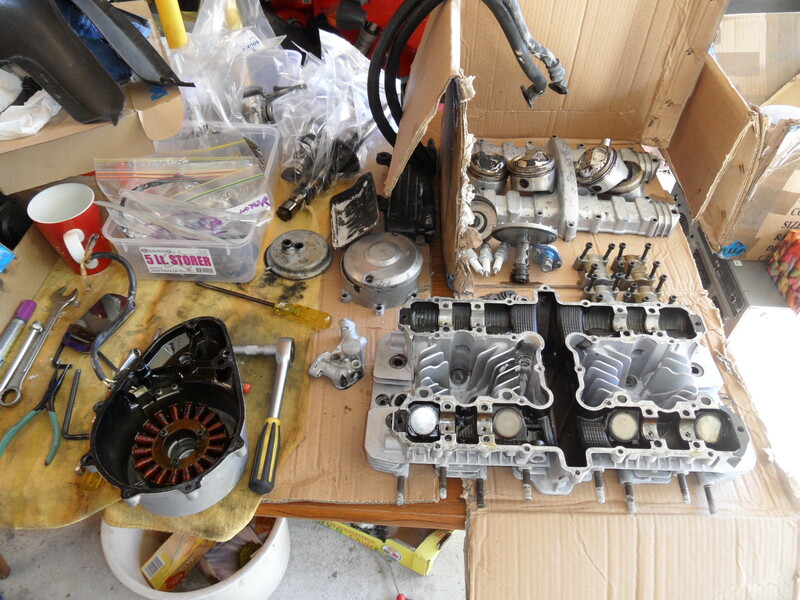 The rest of the parts go on as pieces come back and in the reverse order to disassembly, but with new gaskets! 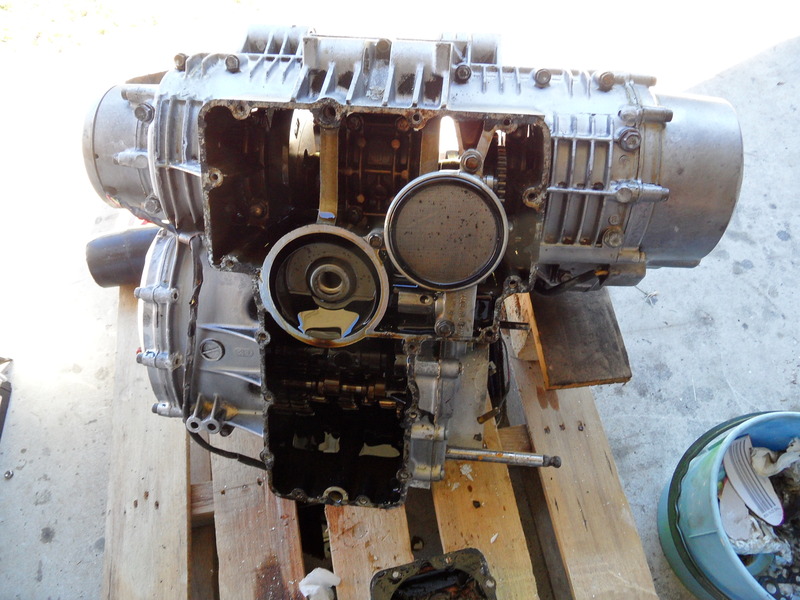 Next: GPz1100B2 – Frame Rebuild – Rebuilding the frame and getting ready to rebuild the engine. 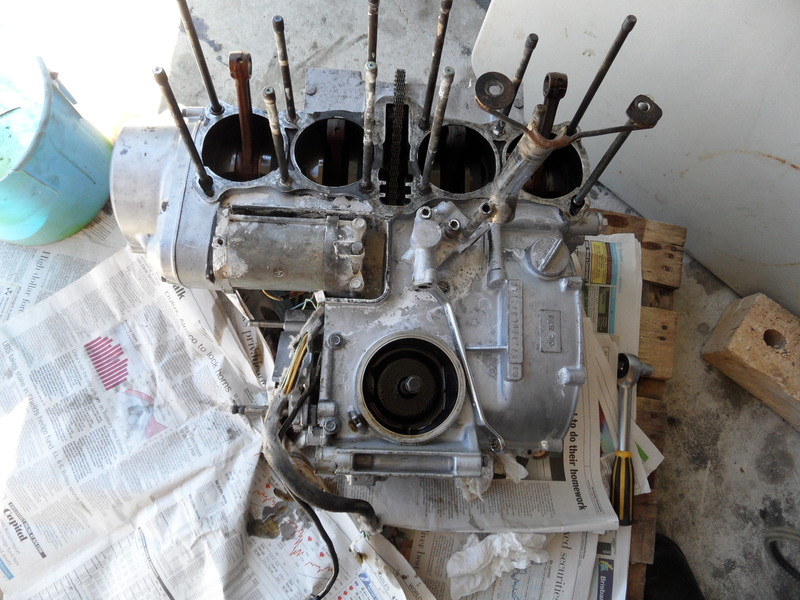 I am very interested in your rebuild, I picked up a B2 a few months ago, which had a leaking head gasket. I pulled the head and barrels off a week ago, I have decide to install in rings while is apart, just waiting for the rings to arrive. Noticed your comment about the dome on your pistons, mine don’t have a dome, just flat. 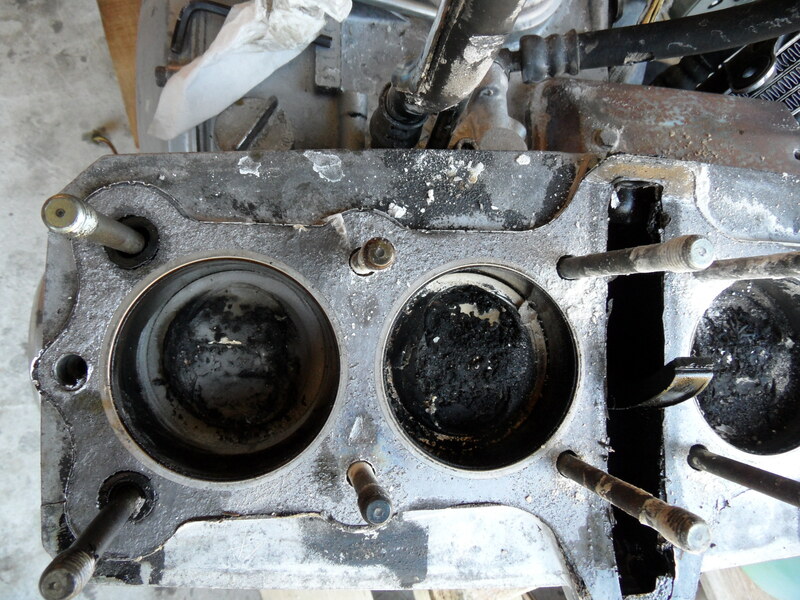 Has your motor been apart before, are they high compression pistons? I will be pulling my bike down in about 6 month for a cosmetic rebuild, not sure if l’ll repaint it red or go for the ELR green, what colour green have you used? Good work, looking forward to see it finished. I am a proud owner of a GPZ 1100 B2 and have some injection problems! When the engine is warmed up after about 10 minutes, the bike want to stall at appx. 6000 rpm. Do you have some information about this problem ? I have not heard of that specific issue, could it be fuel starvation – try removing the filter and run it without to test it?